I came up with this technique when my son was 10 and his school decided to throw its first Holiday Boutique. The other mothers could sew, knit, crochet, scrapbook, decoupage, etc. and I didn’t have anything original to contribute. As the day for dropping off our handmade items got closer, I got desperate. I went into my (then) sparse craft supply drawers and dug up an old flower loom (which they still sell, by the way), some floral wire, some buttons, and some broken jewelry. My first efforts weren’t perfect, but the results were a hit and I sold every one I made. As my craft evolved, I discovered it was a great way to recycle those sentimental (but broken jewelry pieces) I didn’t have the heart to throw out – and it delighted my family to see Grandma’s old brooch shining in the branches of our tree every Christmas. New or recycled beads, spacers, other findings. Some round and oval beads as well as 6.0 seed beads are recommended for best results. Note: The photo is an example only. 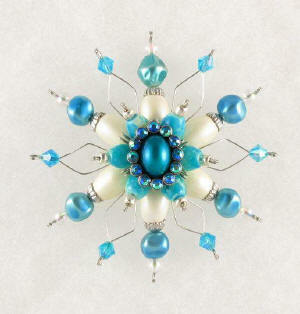 Depending on the beads and centerpiece you use, your ornament will look different from the photo. But this technique is the same for any combination of beads and decorative centers you choose to use. Use the chain nose pliers to flatten the center (this will make gluing the back easier). Starting from the inside petals, use the chain nose pliers to crimp the first loop petal together. 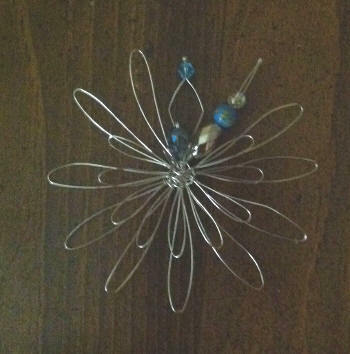 Slide a bead down the petal and then use the round nose pliers to bend the top of the wire over the bead to hold it in place. Crimp the next loop petal and use the round nose pliers to bend it towards the center. Repeat steps 2-3 until you have finished all the inner petals. Starting the outside petals, use the round nose to crimp the tip of a petal behind one of the beads in the inner petal round. Gently slide a 6.0 seed bead slightly over the crimped part just so you have enough wire showing to bend over the bead. Use the round nose pliers to bend the wire over the bead. Using the round nose pliers, insert the pliers between the two wires below the seed bead and gently push them apart. Crimp the next outside petal loop (behind the crimped wire in the inner petal round and slide your beads, spacer, bead cap, etc. down. 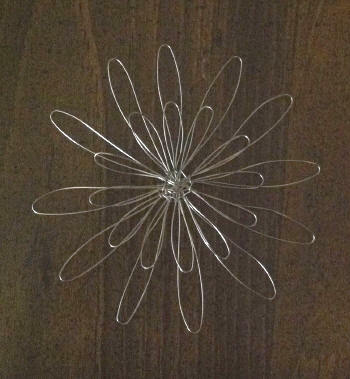 Tip: I usually use an oval bead for this as round beads (depending on their size) will make the outer petals tight (or may cause them to overlap) when you get to the end of the round. Add a decorative button or jewelry part (in the example I used a charm after cutting off the loop) by gluing it to the center. Turn the piece over and glue a button or piece of filigree to cover the back. Attach a jump ring to one of the outer petals (it should attach easily to one of loops you made over the top bead), tie a ribbon to the ring, and attach to your tree.